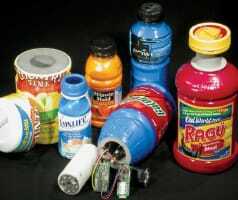 BottleDAQ is a miniaturized force measurement and data acquisition system small enough fit inside a plastic bottle. In addition to measuring cap application and removal torque, BottleDAQ can be custom configured with a variety of sensors to measure force acceleration, temperature, pressure and more. Direct, in-line measurement of capper torque eliminates the need to infer application torque based on short term, manual removal torque measurements. Direct measurement using BottleDAQ makes it possible to optimize planned maintenance activities, more effectively troubleshoot capping machine problems, accelerate packing line startup and reduce costs. The BottleDAQ system moves consumer research to a new level by making it possible to more clearly understand how customers interact with your package. Because the BottleDAQ® system is hidden inside the package unknown to the consumer, bias typically associated with more qualitative approaches can be dramatically reduced. BottleDAQ can be configured to store data internally or continuously stream it through a wireless link to a laptop or PDA. When used in focus groups, the system can measure the force required to open a bottle, and display results – in real time if you prefer. BottleDAQ is battery-powered and consists of a torque sensor, microprocessor, signal conditioning, 16-bit ADC, and Bluetooth wireless communications. we will cost-effectively engineer the system into your package for use by your in-house manufacturing staff, or provide BottleDAQ as part of a comprehensive turn-key data-acquisition solution for use in consumer research settings.